large batch of chaco tortoises (Chelonoidis chilensis). listed them as ‘Cherry-head Red-foots’ on the next price list. turn out to be such a phenomena! applies to the Southern or Gran Chaco red-footed tortoises as well. Northern group red-footed with yellow markings. 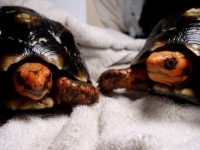 Some tortoise farms in the region call them ‘yellow red-footeds’ and ‘red red-footeds’, apparently to differentiate between the color morphs, or subspecies, or whatever they are. colorful Northern red-footed a ‘cherry-head’ and so on. Buyers beware! ‘dwarf’, do your homework! While Easterns are generally smaller overall than Northerns, they are not ‘dwarf’ versions of Northerns- just a smaller race. they are prettier as well is just a nice bonus! 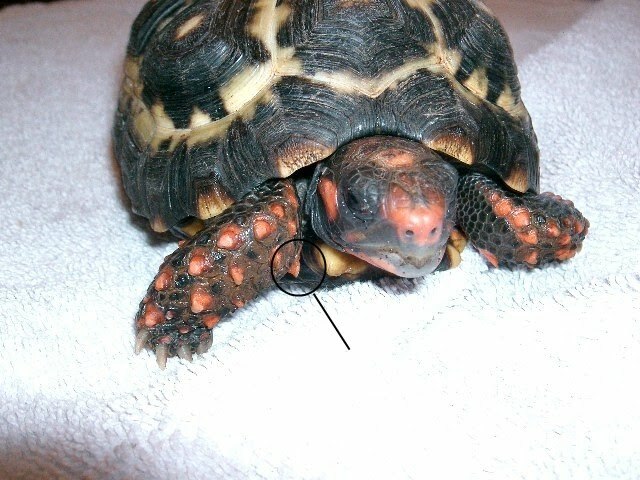 dark plastron, which often lacks a defined pattern. 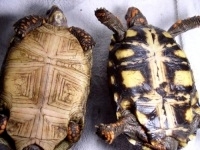 scutes as they grow) than Northerns. enlarged, colorful, scale on the inside of the front ‘elbows’. Northern. This is the ‘Rudolph Sign’. ‘giant’ individuals over 35cm/14in are often found. ‘bowl’ shaped, although there is a lot of variation in this group. often do not have as deep of a plastron indentation. males show a flaring of the rear marginals. giving the shell a bit of a pointy look. 20cm/8in and 6-8 years old. generally do not reproduce well. they come from, but scrub savannas are probably pretty typical. like Lencois and Baiaxa Grande), and possibly Goias, Mato Grosso, etc. grassy wet savanna of the Northeastern red-footeds. extreme growing and fruiting season. ‘Downtimes’- Many keepers have observed that their Easterns slow down in the winter for several weeks. temps and humidity. There is not a strong consensus as to whether we should fight this with higher temps or something, leave them alone, or actually cool things off a bit to allow them to go into some form of dormancy. Most keepers just let them ride through this. Cacti are probably a preferred food in the wild, and they seem to like it in captivity. separated, or in a very large habitat with lots of obstacles so each can have a territory and not see the others. kale. Natural sunlight also affects color- but not in a predictable way. much as other red-footeds, but water should always be available. is sunny, but may hide during cloudy periods. 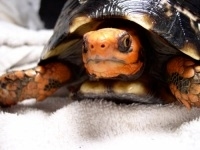 tortoises should be kept warm and humid like other red-footeds. Guix, Juan Carlos, Daniel L. Fedullo and Flavio B. Molina. 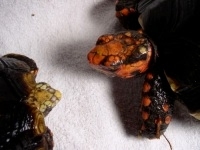 “Masculinization of captive females of Chelonoidis carbonaria (Testudinidae)” Rev. Esp. Herp. #15, 2001. Paull, Richard C. The Great Red-Foot Tortoise (Tortoises of the World, Vol. 4) . Green Nature Books, 1999.ISBN 188808927X. Vargas-Ramirez, Mario and Jerome Maran, Uwe Fritz. “Red- and yellow-footed tortoises, Chelonoidis carbonaria and C. denticulata (Reptilia: Testudines: Testudinidae), in South American savannahs and forests: do their phylogeographies reflect distinct habitats?” Organisms, Diversity and Evolution, 2010. Vinke, Thomas and Sabine Vinke. “The Turtle and Tortoise Fauna of the Central Chaco of Paraguay” Radiata 10:3, 2001.
, Chelonian Library Vol. 3. Chimera Edition, 2008. ISBN 3899736036.